The Avatar themed land that has been under construction for quite some time now at Disney’s Animal Kingdom Park finally has an opening date! Guests of the Walt Disney World will be able to experience the new land starting on May 27th! It looks like new dining options and major attractions will be coming along with the new land. Hit the jump for details on what you can expect in Pandora! Disney was a little sparse on the details of the new land other than just giving a broad summary of what to expect. 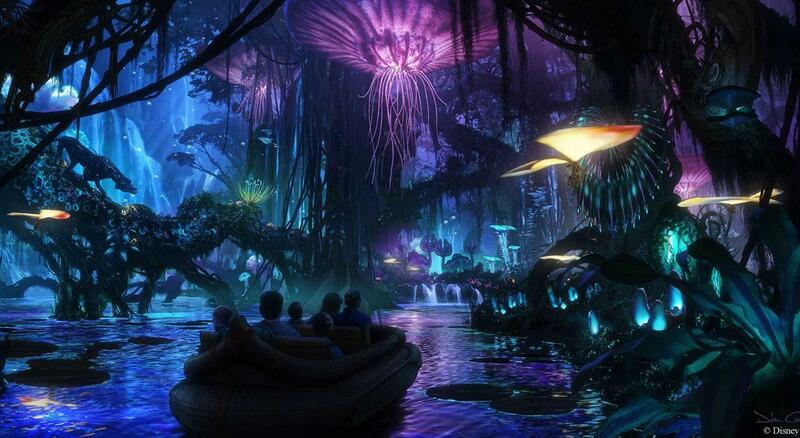 The two major attractions will feature a boat dark ride through the land of Avatar and a more thrilling ride on a “Banshee”. If the animatronic previews that Disney has released so far give any idication these two ride are going to be awesome! Along with the attractions new dining will open up including Satu’li Cantee and Pongu Pongu. We don’t have any idea on what these two options will serve but of course will post about them the minute Disney decides to let us know! Even though the land opens on May 27th I’m sure Disney will have preview events for cast members and hopefully other guests like Annual Passholders and DVC members. If these events do happen more news will certainly get out so stay tuned to Behind Magic! Are you excited for Pandora – The World of Avatar at Animal Kingdom? Do you like the Avatar movie or have you moved on? Leave your comments below or as always, feel free to reach out on Twitter, Instagram or Facebook!